7'5" x 7'5" x 36"
The Salina® is a paradise found. The comfort-styled open seat spa is roomy enough for seven. Its spacious two level footwell features the powerful Euphoria® jet for multi-position enjoyment. 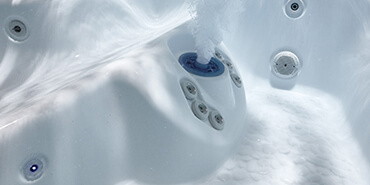 With 40 jets and two, 2.5 HP ReliaFlo® jet pumps onboard, this hot tub is a power-packed massage “machine”. Our simple and intuitive salt system drastically reduces the amount of time spent on water care, so you can spend more time enjoying the wellness benefits of daily hot tub use. 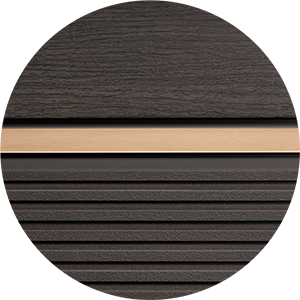 The exclusive EcoTech® cabinet, with its rich color and metallic accent offers a contemporary design that is extremely durable. Salina is rated 4.6 out of 5 by 79. Rated 4 out of 5 by jlw from Great style of hot tub We love our hot tub, we use it almost every evening. Our family is very active so us as parents love the relaxation it provides our muscles and our kids just love it, period. The spacious seating gives enough space for us all to get what we need. my only complaint is the head rests. They all have gotten very warped and bubbly. Wish the quality of these would be on the same level of the rest of the set up. Overall I would highly recommend a Caldera Spa. the value and quality are just wonderful! Rated 4 out of 5 by jbu from Woth it!! I love salina hot tub model. Nothing can compare to this!! Rated 4 out of 5 by Johnny from Salina We use our Calera Salina almost everyday. For the past year and a half there are family nights with low jets and plenty of room for 3 kids, mom and dad. Then there are nights for just dad to crank up the jets for deep relaxation after long hours at work. We had hoped this would be a family success and it has exceeded my expectations and is fairly simple to maintain. So far so good, everyone likes it. Rated 4 out of 5 by harleyjck from Good value This was my first spa purchase.I looked at quite a few spas,but purchased a caldera spa for the value.Purchased the Ozone with the spa also.Jets are great and the foot well jet is just wonderful.That was the selling point for us.The only regret i have is i wished i would have purchased a deeper model.24/7 circulation pump works,my water is clear and sparkling day after day. Rated 3 out of 5 by Parker222 from Great Tub, but told its normal to leak and mold inside..... We purchased the tub a year ago now. My family really enjoys the size and comfort of the spa. The place we purchased it from was great to deal with and have provided great service from their end however the manufacture has not been the same. The Spa is wet inside. The insulation and wood are damp and will be wrecked. The manufacture has told the place where we purchased the spa this is normal. Although the Spa looks great from the outside do not let this fool you. Rated 3 out of 5 by tg from It's ok I like the setup up of the Salina, but my main complaint is that you can not have all of the jets on at the same time. My 15 year old hot tub could do that with no trouble. You shouldn't have to choose who gets the jets on and whether your foot are massaged too. Rated 3 out of 5 by Tlb from Selena I have had this hot tub for 2 years. I bought it just for me and some friends. At first the chemicals where a bit hard to mix to get it right . Was not aware there was so much involved in owning a hot tub. The tub itself is very comfortable but I find I only use it in the winter months. As it's much too hot to get in during the summer. Rated 3 out of 5 by Joanie from Love my spa We love our spa, and the dealer Spring Dance. However there have been some issues. Little less than 2 weeks home multiple jet caps came off. Spring Dance came out repair with no problems. Now the exterior panels have all cracked. Parts have been ordered 4 weeks ago but still waiting for them to come in. Still love our spa and dealer. This has been great help for chronic pain issues. Rated 3 out of 5 by CT14 from Average Performance for the Price Could be a great SPA but have had multiple problems in the first 60 days requiring continuous service calls. Ozonator replaced, SPA sporadically shut down requiring electriacal panel upgrades and water very difficult to keep clear. Rated 3 out of 5 by meesier from Nice tub but not perfect The Salina is a nice hot tub. The dual motors are a very nice feature and there is no lack of power to the jets throughout the tub. There are a few things that I think are lacking. First- I do not like the water bypassing the filters, I know more filters take up space, but to double the filtration capacity and filter more water during a normal run cycle would be better. Second- there is no program mode that will run the jets on a clean up cycle once per day automatically. This would be a huge advantage. Third- while I like the LED lighting system, having lights above the waterline is very annoying. If the top row was moved down only 2-3 inches it would be much more comfortable. Rated 2 out of 5 by Disappointed from Poor exterior construction The exterior paneling on two sides of the tub have several large vertical cracks after less than one year of use and exposure. For the cost of the unit, this is totally unacceptable. While the tub's performance is acceptable, there is no reason for the shoddy workmanship of the exterior. The retailer has been alerted, pictures provided, but no response to date from them or the manufacturer. Rated 5 out of 5 by CoachMel from My second Cladera Spa This is my second spa and I love it just as much as the first one that I purchased 15 years ago. Will always be a Caldera owner. Rated 5 out of 5 by ConnieS from Saline review This is our third spa, and so far our most favorite,. It is the most comfortable spa we have had, hats very fast, send it is well insulated holds the warmth,. Very happy we went Caldera. Rated 5 out of 5 by Hot Tub de Club from Awesome Spa The massage this spa delivers is great and the center jet for the feet is awesome. With the bluetooth speaker system our spa has been named "Hot Tub de Club". Rated 5 out of 5 by Francis from Caldera stands by their products We had a problem with our last Caldera spa(Manufactures Defect) and Caldera stepped up to the plate and replaced it at no cost. This Salina is a great spa and would recommend it to anyone. You just cant go wrong with any of there products. Rated 5 out of 5 by Bill from Niagra to Salina I had my Caldera Niagra for 16 years. I shopped several dealers for a replacement but the Caldera Salina was still the best hot tub at a fair price. Rated 5 out of 5 by JenD from Caldera Spa This spa is comfortable and very easy to maintain. I love the Spa Frog cartridges! Rated 5 out of 5 by Erik from Great design, value and service My family endured a long search for a spa that had one specific feature - room for at least four pairs of feet! The Salina had a large footwell and also the perfect balance of power, jet options and easy to maintain features for the price. Service by Caldera was excellent. When i had an issue with the spa cover, my local dealer (in Canada) was able to liaise with Caldera and eventually i was able to speak with their customer service line directly. The end result - new cover components were shipped directly to my door! Rated 5 out of 5 by Stellavator from Great Spa What can I say, it does what you expect in a spa of this quality. Easy to set up and use. Easy water care. Easy maintenance. Always ready when you are to jump in. Very comfortable with great jet options and positions. We used it all winter, and put it down to 93 for summer cool-off dips. Very happy with our purchase. Rated 5 out of 5 by Reid from Great spa! As first time spa owners this has been a great purchase. With the frog system water care has been easy to maintain. I think you get a lot in this spa for the price. Plenty of jets, with lots of options. The controls are easy to use and the spa is great quality. We couldn't be more satisfied with this purchase. Rated 5 out of 5 by Tim G. from Excellent product I use my Caldera Salina daily and enjoy the message and relaxation that comes with it. It also provides a great venue for get-togethers with family and friends. It's easy to care for, though I had no success with the Frog system that came with it. The chemical readings had to be adjusted daily, so I just use test strips and adjust the chemicals as necessary, usually just once a week. Rated 5 out of 5 by Randw1002 from Love the Salina Great, easy to maintain hot tub! So relaxing after a hard days work! Rated 5 out of 5 by siddyf11 from Best purchase ever fs! I am loving the Salina spa! It fits my entire family and is so easy and relaxing to use. I love all the features and its very easy to clean! I am so happy with this great investment. Rated 5 out of 5 by David1002 from First time spa owner...so glad I choose Salina Having only purchased the Salina less than a month ago, the moment my family stepped into the spa, we were in a tranquil bliss! Love all the jets and different seats. I prefer the powerful seat with 6 jets while my wife prefers the more subdued seat with a mild massage. We have spent many relaxing evening in the Salina. We are looking forward to enjoying it for many years to come! Rated 5 out of 5 by R&D from Salina is awesome ! We've had our spa for 8 months and absolutely love it. We've had up to eight people in the spa but most of the time it is just my wife and I. Each seat provides a different message that can be adjusted from soft to invigorating. Whenever there is a clear night out we will usually be out in the spa enjoying a great time under the stars. It didn't take too long to master the water care. I find that keeping a log helps with the water care. Rated 5 out of 5 by JM13 from Relaxation at it's best I purchased my Caldera spa in October 2012. Since then my family and I have spent many evenings relaxing in our spa. The warm waters and massaging jets work wonders on my 40+ year old body and feel great after a long days physical labor. Originally I purchased the spa as a gathering spot for my family but found an added benefit when it helped relieve a nagging back pain I had for years. Physical therapy, cortisone, memory foam mattress, I tried them all and had given up, boy was I surprised when a 20 minute soak took away my nagging pain. Thank you Caldera! Another great benefit was getting the family unplugged and all together, just to talk and hear about their day as we soak in the spa. Every family needs some time like that and this product helped bring us together. Even if only to gaze at the stars...I love my Caldera spa! Rated 5 out of 5 by tony from Relaxed Money well spent. After a hard day at work, nothing is better than to relax in a Caldera Spa. Rated 5 out of 5 by Odie131 from Erasing Stress Day by Day We knew all the benefits we'd receive from being spa owners, but didn't know if the upkeep would be too daunting. It has been fairly effortless and we have been enjoying its benefits all winter long. We are so happy to have a place to go unwind and melt our stress away. I would never hesitate to recommend this spa and the wonderful folks we purchased it from. Win win! Rated 5 out of 5 by chrisp993 from Paradise Found? Extremely happy with my Caldera Paradise Salina spa - water care is easy, taking just a few minutes a week and comfort is great. Particularly appreciate the depth (I'm 6') and variety of jets with very comfortable space for up to 4 adults - any more than that need to be good friends. Only negatives is the "spinning" jets don't really spin that well - have cleaned them but that doesn't seem to make any difference, so these jets really default to being able to be pointed rather than rotating freely. But, really, if doing it over I would be happy to buy this spa again. Rated 4 out of 5 by Shawn from Worth it! My husband and I purchased theSalina model hot tub and are very happy with it. It is used almost every night by us and our family (when they are visiting) Would recommend this model to anyone! Rated 4 out of 5 by MaineTubFamily from Many Time User - First Time buyer Been wanting a spa for a number of years. Did three months of research and talked to the two biggest dealers in Southern Maine. Was going to go a different direction, but the other dealer spoke the truth about how the spa was made, the internals and such... So we went Caldera and we purchased our unit site unseen and trusted our dealer that the Salina would be a better choice than a similar model from another leading maker. And he was right -love the unit. My only compliant / critique would be to use better, thicker handles on the two diverter valves. It would be only a be a few dollars more, but the "Feel" of the handles would make the unit seem that much more of a value. Easy setup, fast heating from a fresh fill and maintain chemistry is fairly simple. Rated 4 out of 5 by SEAMONKIES from THE FIRST MONTH MY FAMILY HAS HAD A LOT OF ENJOYMENT IN THE FIRST MONTH WITH OUR SALINA. THE KIDS AND THEIR FRIENDS SEEM TO BE IN IT EVERY NIGHT. WE ARE LOOKING TO THE COOLER NIGHTS IN THE FALL. THE TUB IS EASY TO MAINTAIN, AND IS A RELAXING RETREAT FOR ME AN THE WIFE WHEN WE CAN KICK THE KIDS OUT OF IT. Rated 4 out of 5 by Ed and Lisa from So Far, So Good! We have owned our spa for a month and we have used it nearly every night. It helps us recover from the day and sleep like babies! The spa appears to be well built, but it's early and time will tell. It has been a little bit of a struggle to get the chemicals right, but our dealer has been very helpful. We looked at several spa brands, but kept coming back to the comfort of this model. The Salina is roomy and comfortable for us. Rated 4 out of 5 by Snowy from Outside Paradise The Salina Is a very comfortable and attractive hot tub. We have it outside on the patio and a snowy day is my idea of Caldera relaxation. A good long term investment in comfort and fun. Minor distractions: 1. Rubber head rests are hard to clean once body oil stain them. 2. The remote for the music system never worked right and I had to buy a new one after it died in less than two years. Rated 4 out of 5 by Evoglewede from Our Piece of Paradise We love our new spa. It's like having a retreat right in our own backyard. Best money spent. Enjoy entertaining friends, quiet time with my husband, and a time to reconnect with our family. This model is very thereputic. We bought this early in the summer. It has been a mild one and so we've enjoyed 3-5 times a week. It's easy to maintain. Rated 4 out of 5 by CJ from Love it! We have never slept better. Music system is not user friendly for me is my only complaint. Rated 5 out of 5 by Spa-me from Every day is a spa day Overall we couldn't be happier with our spa. We've had a ThermoSpa and Jacuzzi hot tub in the past and we like the Caldera better than the others. Maintaining the water balance is much easier. Unfortunately the day after we had the spa installed we had a major wind storm and our power was out for four days in below freezing weather. The spa dropped in temperature but not as much as we thought it would so we didn't have to drain it. We can attest to the quality of the product to keep its temperature. The only minor complaints would be with the cover and the foot pump. It would be nice to have a handle on the inside to help slide it forward so it can be closed and having the foot jet on a separate pump. But neither complaint would prevent us from highly recommending a Caldera spa. Rated 5 out of 5 by Ken from Very Happy Think spa is great and don't at all regret decision to get it. Real addition to lifestyle and appreciate all the therapeutic benefits. I'm on a learning curve with regard to water care. Not difficult but tend to watch it closely to make sure nothing goes wrong. Rated 5 out of 5 by Dk1230 from Father's Day Gift Sitting in Calder Salina hot tub right now writing this review!! ! This is an investment in my health and well being for so many reasons!! Sometimes I even get in before going to work and look forward to coming home to just relax and look at the stars. My kids and their friends also enjoy time away from screens and hanging out. 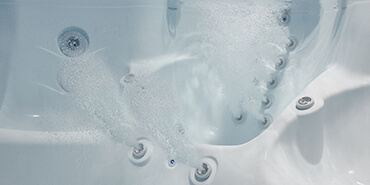 The Salina is a spacious comfortable tub that requires very little care. Rated 5 out of 5 by Dkh1985 from Very happy so far Bought this tub a month ago so far so good. The only thing that is annoying is the rings on the floor jets come undone often when people walk around in the tub, its not a big deal because they twist right back on , just annoying. Otherwise very happy so far. Rated 5 out of 5 by Bill M from Love my Salina I love my new Salina. My wife and I have been taking a soak each evening and both sleeping better for some reason. I assume the reduction of tension. The large foot well is awesome. So many tubs we tried had everybody's legs jammed together because the foot well was so small. We have only had 4 people in it at once, but can tell that 7 would be no problem. Water maintenance is very easy. Much easier than the pool we had for 17 years. Wish we would have done this 17 years ago. Rated 5 out of 5 by Deb from Love it!! We love our new Caldera Salina hot tub. We have used it every night since it was installed. Rated 5 out of 5 by Suz EQ from Why did we wait so long? I have been more relaxed I the two week since our Caldera arrived than the two years prior, combined. This is truly a life-changing stress reducer, joy maker and health enhancer. Rated 5 out of 5 by Steve from nice and relaxing One of the best purchases I could have made for my wife. It definitely relaxes her and is easy to maintain. Just have to make sure you get the water and chemical balance right and maintaining it from there is a breeze. The pumps are quiet and the lights and water flow really help relax. Rated 5 out of 5 by AndreB from Salina after a few days After 4 days of using our new hot tub, we love it! The sales and delivery team were great, and we got the hot tub up and running very quickly. The water hit 100 degrees within 4 hours too! We've been tracking our electric use, and even though its summer, its been a very minute uptick. Better yet, I've turned the summer mode on in the morning so the heater wont run, and after 7 hours with the heater off, the water is still 100! I can tell everything is well insulated! So far, we are very happy! Rated 5 out of 5 by TravisAmandaS from Great Spa Started out a little rocky (had issues with a button getting stuck and software updates), but the service department was great and we haven't had a problem since. Rated 5 out of 5 by andif from Best Hot tub ever! I have owned various hot tubs over a 20 year period and have never had one as wonderful as this one. The sales process was fabulous, the tub itself has the strongest jets ever, which is what I love. I'm in heaven with my Caldera Spa. Rated 5 out of 5 by Mj from Ahhh!! We have had our Caldera Spa for more than a year and we love it! It is easy to care for and operate. We have used it through all the seasons but especially enjoy a soak on those cold winter nights..so soothing and relaxing. Feels great on the back and very helpful in relief of sore muscles. Our Caldera spa is the best!! Rated 5 out of 5 by Collin209 from Great spa Very relaxing! My wife and I love coming home and spending time to unwind. So happy we made this purchase. Rated 5 out of 5 by cookie from We love our hot tub! We have had our hot tub for just over one year. It has provided us with some great family time and conversations. Our kids have enjoyed it with friends. We have not regretted buying our hot tub! Rated 5 out of 5 by 08 Mustang GT from Salina, "great and relaxing" I enjoy soaking in my Caldera "Salina" hot tub after a hard days work to kick back and relax. At times the whole family gets in it to enjoy the warmth and easy use of the functions of this great spa. Rated 5 out of 5 by Dale55 from We love our spa Had never even been in a spa before purchasing. It is wonderful, we use it about 2-3 times a week, so relaxing and makes everything feel better. The lighting at night is gorgeous. Rated 5 out of 5 by Mike from Salina - 6 months in and loving it. I've had the Salina for about six months. The pump and display screen went out within the first 3 months. Though the tub was under warranty, we were still out of commission for about a week due to scheduling a service call. The tech fixed the issue and we were granted a "1 time free service call", but any other calls will incur a charge. Since the fix, the Salina has been great. We've found we used it A LOT more in the winter months that the summer months. I am very happy I didn't opt for the lounge. The additional seat has come in handy. Rated 5 out of 5 by JSSHEA235 from Great Hot Tub! Best Hot Tub We Have Owned! Very Easy To Clean & Maintain. Rated 5 out of 5 by bar1068 from Verrrry Nice Spa!! Only second spa we've owned. Last one was 20 years old when we decided to replace it with the Salina. What a huuuuugge difference!! We've only had the spa a short time, but enjoy it immensely. Biggest selling point for us was the Euphoria foot jet, that is awesome!! Rated 5 out of 5 by Your_poolboy from Use my salina spa everyday! I've had both my knees surgery repaired and after any activity I use my spa to recover. I use it in the morning before work and at night to help sleep. Wouldn't live without one. Rated 5 out of 5 by BRIKIT33 from Greatest present we got ourselves. Greatest present we have got ourselves since our 5 children have grown up and moved out. Makes all your aches and pains disappear.We have been in our tub everyday since it was delivered at the end of February.Most relax we have been in a long time. Biggest surprise came this week when we received our electric bill and found it was only costing us around 50 cents a day. Average temp here in March is 35 degrees. We are keeping our water temp right at 99. Thought only costing $15 a month was excellent. Excellent product and Excellent quality. Thanks Caldera for help making our early senior years wonderful. Rated 5 out of 5 by Ebias from Quality Product When we got our Salina Spa, I was taken aback by the quality and strength of the construction. When the technician opened the cover to connect the electricity, I was surprised by the filleted corners and sturdy, clean construction. Everything seems to be in its own specially design spot. Very nice. Rated 5 out of 5 by MJ from Spa-ctacular! Our Salina hot tub has turned our backyard into our own private resort. For less than the cost of a summer vacation we now have the luxury of soaking away the summer evenings, gazing at the stars while receiving a lovely massage provided by those 40 fabulous water jets. Maintenance is a cinch with the bromine and minerals cartridges...so much easier than our old pool. Our only regret is that we waited so long to own a Caldera spa! Rated 5 out of 5 by GAB from Best thing I have purchased We did our research and tested different spas at Tradewinds Spas. We sat in many and fell in love with Salina. Once we had it home we really found that we should have bought our spa years ago. It is a stress relief and source of comfort. When friends come over they all agree we made the best decision when we bought our spa! Rated 5 out of 5 by Clomper from Very happy! I bought this hot tub to help relax my lower back. I was 28 years old when I bought it and my back was worn out a bit from my time in the marine corps. I chose this hot tub as each seat offered a different pattern of massage. Also another selling feature I was looking for was a circular seat pattern so everyone in the hot tub would be facing the center and could talk with everyone in the hottub. I didn't want a lounge in which one person would be laying down looking up. Also the lounge takes away the space another person could be sitting in. I've had this hot tub three years now and it still looks and runs like new. I often have large groups in it and do water changes every three months. Easy maintenance if taken care of. Rated 5 out of 5 by Kbloom from Great Spa While this is the first spa that I have owned, it is great and relaxing. 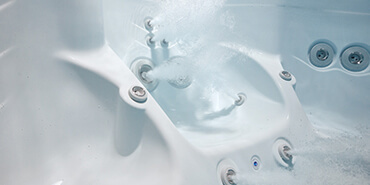 The use of the functions are easy and the jets put out more than enough water pressure to help relax those tired muscles and joints. It is very easy to clean and maintain. Rated 5 out of 5 by Jill123 from Super Purchace! The crane delivery was scary but went perfect. Woke up this morning a 6 and had the best relaxing time ever in my Salina Spa. Jets work perfect with ease. Looking forward to friends and family coming to enjoy with me. Can't understand what took me so long. but I feel I have purchased the best spa money can buy. Rated 5 out of 5 by Toula from LOVE MY HOT TUB! First time owner of a hot tub. Best purchase I've made. Love the ease of care. Rated 5 out of 5 by Matt819 from First Purchase I did a lot of research and decided on Caldera. From the insulation, jets, quality of material and price, it was the best choice. Easy to install and use. Very pleased, would recommend to anyone. Rated 5 out of 5 by Steviefraz from Simply the best!! The Paradise Salina from Caldera Spas is the 400 gallon 7 seat luxurious model. There are others models more expensive within their product line but they're literally unnecessary. After hours and hours of research, the Paradise Salina does it all. When we get in, I actually like to rotate in all the seats since all have a little different jet location and they hit different spots on your body. The seats are all very comfortable. We don't prefer the lounge seat so this fits us to a tee. To top it off, the local dealer, Clearwater Spas in Delaware, has just the best, friendliest installation and service you could ask for. I have make some bad decisions in my life as we all have. This was not one of them!!! Rated 5 out of 5 by Nesha75 from Salina is awesome The Salina is awesome! Very comfortable and easy to operate. Rated 5 out of 5 by Todd65 from Caldera Salina Family and friends in it every day and night. Everyone loves it! Relaxation, fun and family bonding time all at once! Rated 5 out of 5 by Lori from Love my hot tub Easy to take of. Love relaxing in tub. Each seat hits different parts of body! Well worth the price! Rated 5 out of 5 by David from Excellent Hot Tub The Caldera Salina is an excellent hot tub! My family gets a lot of use out of this spa. Well made and quality features. I would highly recommend Caldera spas to anyone.